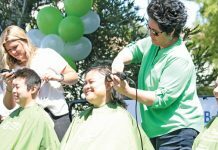 The Run Seal Beach organization gave $115,000 in grants this year to 64 local organizations, including the city of Seal Beach. The Run Seal Beach directors also gave in $11,500 Director’s Awards grants to 17 organizations. Race day has come and gone. Thousands of happy walkers, runners, volunteers, sponsors and spectators left, filled with the spirit of community that comes from being a part of the Little Run with a Big Heart! But for the seven members of the Run Seal Beach Board, much of the work was yet to be done. 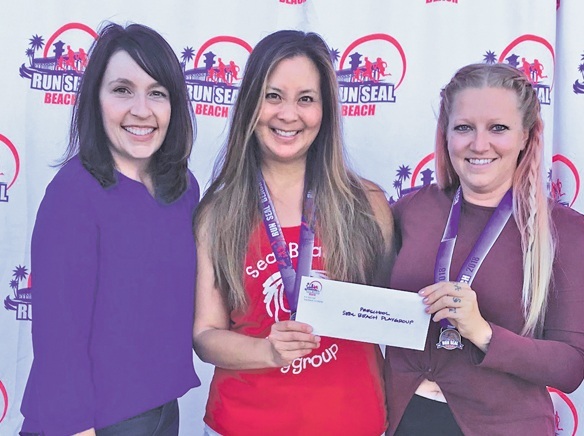 The core charter of Run Seal Beach is to raise funds and awareness for recreation or fitness programs and services to benefit the greater Seal Beach Community including Rossmoor and Los Alamitos. Since 2003, RSB had given back over $1,600,000 to our community, representing more than 114 organizations through the years, touching thousands of residents, students, servicemen and those who are served by our community. This is done through a grant process and the gift of Director’s awards. Led by Michelle Samuelson this year, the grant process was under way shortly after the conclusion of the race. 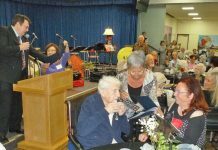 After receiving many grant requests from organizations throughout the community, a grant committee, comprised of Run Seal Beach Board members and lead volunteers, took on the difficult task of poring over the requests to determine and later vote on how the funds raised this year would be distributed. An announcement was sent to all grant recipients and on Monday, June 25 most of those happy community volunteers and contributors met with Run Seal Beach Board members in front of Council Chambers at Seal Beach City Hall to pick up their grants and Director’s award checks. Many stayed for the scheduled City Council meeting that evening, where several Board members, led by Run Seal Beach President Greg Phillips, addressed City Council members, the city manager and staff, and residents and citizens both in attendance and watching on SBTV3. In his presentation, Greg revealed that a total of $115,000 was being awarded this year – $103,500 was awarded to 64 organizations through the grant process, and $11,500 was awarded to 17 organizations through Director’s Awards for a grand total of $1,688,064 over 16 years! Where has all that money gone over the years? $202,568 (12%) has gone to Los Alamitos based organizations; $253,210 (15%) has gone back to our event partner, the City of Seal Beach, benefiting the Police Department and Marine Safety; other Seal Beach based organizations have received $203,000 (12%); Los Alamitos High School Booster clubs have received $449,920 (27%) and other Los Alamitos Schools and Project SEEK (non-booster) have received $579,366 (34%) over the last 16 years! Be the Good, Boys & Girls Club Cypress, City of Los Alamitos; Volunteer Program, CPENA, LAHS Aquatics, LAHS Athletic; Department, LAHS Band, LAHS Basketball – Boys, LAHS Basketball – Girls, LAHS Cross Country, LAHS Dance, LAHS Drama, LAHS Football, LAHS Golf – Boys, LAHS Golf – Girls, LAHS Grad Night, LAHS Ice Hockey, LAHS Lacrosse, LAHS Show Choir “Noteables,” LAHS Soccer – Boys, LAHS Soccer – Girls, HAHS Softball, LAHS Sports Medicine, LAHS Tennis – Boys, LAHS Tennis – Girls, LAHS Track and Field, LAHS Volleyball – Boys, LAHS Volleyball – Girls, Lee Elementary School, Los Alamitos Educational Foundation (LAEF), Los Alamitos Girls Softball League, Los Alamitos Youth Baseball, McAuliffe Middle School Pe, McAuliffe Middle School Instrumental Band, McAuliffe Middle School Jazz Band, McAuliffe Middle School – Show Choir, McGaugh Elementary – Project SEEK, Oak Middle School Choir Program – Friends of Music. Oak Middle School – Instrumental, Precious Life Shelter, Preschool – Seal Beach Playgroup, Preschool – Sun N Fun, Rotary of Los Alamitos & Seal Beach, Save Our Beach, SBPD – Challenge Coins, SBPD – Police Explorers, SBPD – Police Officer Association, SBPD – Red Ribbon Week, SBPD – Volunteers Association (VIPs), SBTV3, Scouts – Boy Scouts Pack 116, Boy Scouts Troop 642, Girl Scouts SB Service Unit (all troops), Seal Beach Animal Care Center, Seal Beach Boardriders, Seal Beach Chamber of Commerce, Seal Beach City – Marine Safety, Seal Beach Leos, Seal Beach Lifeguards, Seal Beach Lions, Seal Beach Swim Club, St. Hedwig, Summer Harvest, SYA Foundation, Tennis Center – Seal Beach, Young Marines – Southeast County, Youth Center. Autism Partnership Foundation, Casa Youth Shelter, Cat Paw, Children Today, City of Los Alamitos – 4th of July, Friends of the Library – Mary Wilson, Friends of the Library – Rossmoor Branch, Friends of the Seal Beach National Wildlife Refuge, Honoring Our Fallen, Interval House, Ladies of the Evening (LOTE), New Hope, Project SEEK, Seal Beach Chamber of Commerce, Seal Beach Performing Arts Association, Summer Harvest, We Care. 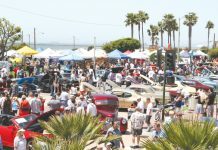 Event Partner – The City of Seal Beach; Platinum Sponsors – The Bernadette Family and G&M Oil; Gold Sponsors – Fresh Cut Creative, Dendreon and Scan; Silver Sponsors – F & M Bank, Clean Energy and AES; Bronze Sponsors – DTS, Shey Harding Executive Search, Bay Hardware, Phillips Steel, Automotive Excellence, Sea Air FCU, Braithwaite Chiropractic, Anytime Fitness, Alamitos Eye Care, The Bay Theatre, Avila’s El Ranchito Mexican Restaurant, Seal Beach Chamber of Commerce, Seal Beach Lions, Richards| Watson|Gershon Attorneys at Law, Kind Bar, TruMoo, Wicorek Family Dentistry, Calcopa, Sun Newspapers, News Enterprise, Shaw & Blasi LLP, Dekra-Lite and Ned’s Produce; Runner Sponsors – Long Beach Marathon, Fit Bar Superfood Café and Orange Theory Fitness; and Walker Sponsor – Hennessey’s Tavern Seal Beach. For full details of grant amounts awarded, visit www.rusealbeach.com/grants.